A 1973 AHM catalog includes this "Foreign Prototype Locomotive" available in three different schemes. Here is what AHM's catalog states for this French Pacific, "Beautiful reproduction of the 4-6-2 French steam locomotive 231 E of the SNCF used for express train service. Very finealy detailed valve distribution. Twin front headlamps. Very powerful. European Prototype equipment is available in limited quantites direct from AHM, however, first we suggest you contact your local hobby dealer. Catalog CA-R on Rivarossi European Prototype available direct from AHM for 50 cents." 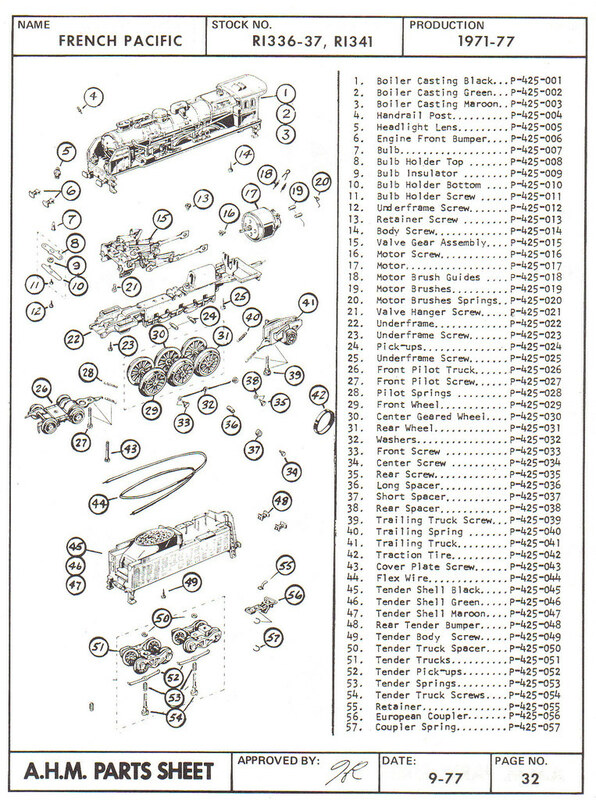 AHM's 6-1-73 price list shows this model retailing for $39.98. AHM's 8-1-77 price list shows the French Pacific retailing for $119.98. I don't find this model in later '70s AHM catalogs. Above is AHM's parts diagram for the French Pacific. You may click on the thumbnail image to open a large version for best viewing.